Great Adventures Reef & Green Island Cruises - Tourism Town - The Tourism Marketplace - Find and book authentic experiences. After a day on beautiful Green Island on the Great Barrier Reef, you’ll experience on two picturesque journeys over ancient Wet Tropics rainforest and a day in the rainforest village of Kuranda. Coach transfer from Smithfield to Cairns / Northern Beaches accommodation (exc Holloways, Yorkey's or Machans). For a tropical island adventure, Great Adventures will take you to Green Island, a beautiful 6000 year old coral cay, for a unique reef and rainforest experience just 45 minutes from Cairns. You’ll have the choice of snorkelling equipment to snorkel directly from the white sandy beaches or a glass bottom boat tour to experience this tropical Great Barrier Reef island. As a Great Adventures guest, you’ll also be able to enjoy many exclusive inclusions such as the use of the island swimming pool and a self guided eco island walk to discover some of the island’s unique rainforest flora. The island’s well-appointed day visitor facilities include a pool bar, restaurant and refreshment outlets. Choose from a range of delicious and affordable meal and snack options with great kid’s menu options too. There’s also a wide range of optional activities in addition to your cruise fare to experience on Green Island. Scuba dive, join a snorkel excursion, kayak or even walk underwater with Seawalker helmet diving. For an exhilarating top-side perspective of the reef, there’s parasailing and scenic helicopter flights too! There’s even the Marineland Melanesia Crocodile Habitat with daily crocodile shows. From Green Island: 12:00pm, 2:30pm, 4:30pm. Start your day aboard the famous Kuranda Scenic Railway, meandering to the Barron Falls and through mountainside tunnels. This breathtaking journey on one of the world’s most scenic train routes will take you through hand-hewn tunnels and across bridges with amazing views. Stop at Barron Gorge to view the falls before arriving at Kuranda station. The remainder of the day is free for you to explore the “Village in the Rainforest”. Visit the Heritage Markets, which operate daily, or perhaps visit the Australian Butterfly Sanctuary, Birdworld or the Kuranda Koala Gardens (own expense). Lunch is at own cost. 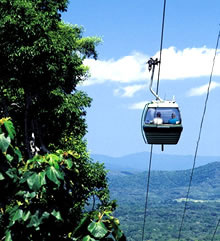 At the scheduled time, board Skyrail for the world’s most beautiful rainforest cableway experience. Glide over the rainforest canopy and take advantage of the two stops en-route to enjoy a walk through the rainforest or visit the Rainforest Interpretive Centre. Your journey ends at Skyrail’s Smithfield Lakes station where your coach will be waiting to take you back to your accommodation. Complimentary hotel pick-up, time advised at time of booking. Children: 4 -14 years; Children 3 years and under cruise for free. Family fare – maximum of 2 adults and 2 children of the same family. Normal fare applies for additional children. Not applicable with any other discount. Listed fares in Australian dollars include Goods and Services Tax. Prices valid to 31 March 2019. Payment is not required at this stage. Great Adventures Reef & Green Island Cruises will contact you directly to confirm payment options and availability.